Dungeons and Dragons have been introducing their new storyline, Rage of Demons, lately and I couldn’t be more excited. The demons that have come together to wreak havoc are truly amazing, and I’m thrilled that the release date of their newest campaign, Out of the Abyss, is finally here! To celebrate, I’ve made a delicious snack based off one of my favorite demons, Zuggtmoy. Zuggtmoy is the Demon Queen of Fungi, and in this storyline, she’s looking forward to marrying a large, city-sized fungus. It’s gonna be a wedding ceremony every Demon Queen of Fungi dreams about. 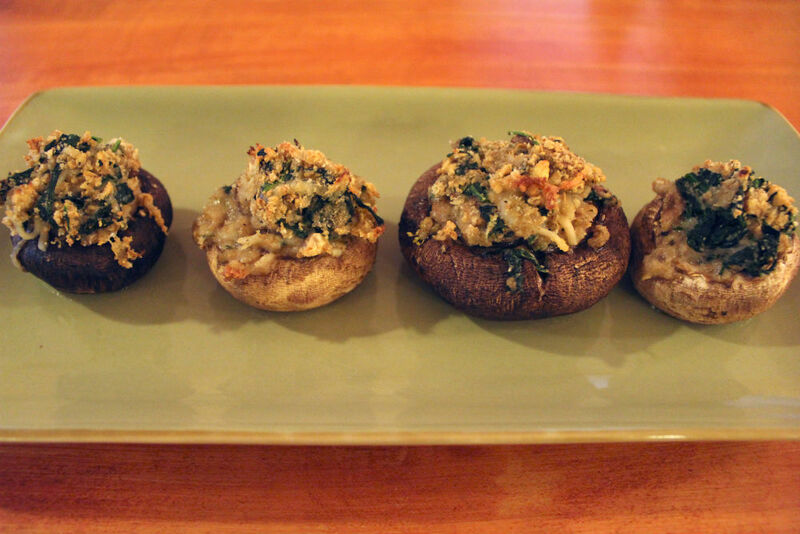 And what better to have at your wedding reception than some beautiful stuffed mushrooms? Preheat the oven to 400 degrees F and line a baking sheet with foil. Set aside. Remove the stems from the mushrooms and set the mushrooms, cavity side up, on the foil-lined baking sheet. Give the stems a fine chop. Cook the spinach in a pan until wilted, about 2 minutes. Remove the spinach from the pan, squeeze out all excess liquid, and chop fine. Add 1 TBS of olive oil and the minced garlic in a pan, and saute until golden. Add the minced stems to the pan and saute until soft. Remove the pan from heat and add the spinach, breadcrumbs, and cheeses. Mix all of the ingredients together. Using a small spoon, stuff the mushroom cavities with the mixture. Bake for 20 minutes, or until the filling is golden on top and heated throughout. And speaking of Dungeons and Dragons… I’ll be a part of the Dungeons and Dragons Extra Life livestream on October 4th! Donate money to Seattle Children’s Hospital while helping me design the character I’ll be playing here. As a bonus, I’m competing against my husband to see who can raise more money each week. The loser has to do horrible tasks (like reciting poetry while eating hot wings) on video for your benefit! Check out my page at extra-life.org to find out more info and make a donation! I’m really lichen this recipe. …And vegetarian to boot. Man I love adventures with a happy ending for all, including companions, familiars, and other beasts.